ایجابی, ابراهیم, بیات, روح اله, شیروانی ناغانی, مسلم. (1397). اولویتبندی انواع انرژی در ایران با هدف افزایش امنیت انرژی در افق 1404 هجری خورشیدی (با استفاده از روش تحلیل سلسله مراتبی). مطالعات راهبردی سیاستگذاری عمومی, 8(29), 135-157. ابراهیم ایجابی; روح اله بیات; مسلم شیروانی ناغانی. "اولویتبندی انواع انرژی در ایران با هدف افزایش امنیت انرژی در افق 1404 هجری خورشیدی (با استفاده از روش تحلیل سلسله مراتبی)". مطالعات راهبردی سیاستگذاری عمومی, 8, 29, 1397, 135-157. ایجابی, ابراهیم, بیات, روح اله, شیروانی ناغانی, مسلم. (1397). 'اولویتبندی انواع انرژی در ایران با هدف افزایش امنیت انرژی در افق 1404 هجری خورشیدی (با استفاده از روش تحلیل سلسله مراتبی)', مطالعات راهبردی سیاستگذاری عمومی, 8(29), pp. 135-157. ایجابی, ابراهیم, بیات, روح اله, شیروانی ناغانی, مسلم. اولویتبندی انواع انرژی در ایران با هدف افزایش امنیت انرژی در افق 1404 هجری خورشیدی (با استفاده از روش تحلیل سلسله مراتبی). مطالعات راهبردی سیاستگذاری عمومی, 1397; 8(29): 135-157. این مطالعه برای ارزیابی و اولویت­بندی انواع مختلف انرژی در ایران شامل نفت، گاز طبیعی، زغال سنگ، انرژی هسته­ای، انرژی­های تجدیدپذیر، انرژی برق­آبی و زیست سوخت­ها انجام شده است. قسمت اعظم مصرف انرژی در ایران مربوط به هفت نوع ذکر شده است. این انواع مختلف از انرژی از نظر مفاهیم چهارگانه انرژی شامل فراهم بودن (6 مؤلفه)، در دسترس بودن (4 مؤلفه)، قابل خرید بودن (5 مؤلفه) و قابل قبول بودن(3 مؤلفه) دارای سطح امنیت متفاوت هستند. در این مقاله قصد شده با استفاده از روش تحلیل سلسله‌مراتبی و تکنیک تصمیم­گیری تاپسیس انواع انرژی موجود در ایران را با هدف افزایش امنیت انرژی و با توجه به معیارهای ذکر شده ارزیابی و اولویت­بندی آن‌ها را مشخص کنیم.20 فرد خبره 7 نوع از انرژی را از نظر معیارهای چهارگانه (18 زیرمعیار) با یکدیگر مقایسه و ارجحیت آن‌ها را مشخص کردند. برای ارزیابی هر گزینه نسبت به هر معیار از مقیاس 1 تا 9 (مقیاس دوقطبی) بهره گرفته شد و پس از تشکیل ماتریس تصمیم‌گیری در یک فرآیند شش‌مرحله‌ای تکنیک تاپسیس انواع انرژی مورد استفاده در ایران اولویت‌بندی شدند.نتایج نشان می­دهد گاز طبیعی به دلیل نزدیکی به معیارهای مثبت و فاصله داشتن از معیارهای منفی به‌صورت همزمان، به عنوان مناسب­ترین نوع انرژی در راستای تأمین امنیت انرژی مشخص شده (69125/0= Ci) و انرژی­های برقی تجدیدپذیر(67354/0= Ci) و انرژی هسته ­ای(62853/0= Ci) در اولویت­های دوم و سوم هستند. ساعی، احمد و مریم پاشنگ. 1395. «ضرورت نگاه فراملی به امنیت انرژی». راهبرد. سال 24. شمارۀ 80 (پاییز) صص 233- 253. سلیمی ترکمانی، حجت. 1396. «لوله­های فرامرزی گاز و امنیت انرژی جمهوری اسلامی ایران». فصلنامۀتحقیقاتسیاسیبین‌المللی. شماره 32 (پاییز) ص 71-88. مزرعتی، محمد. 1391. «امنیت انرژی، دو روی یک سکه: امنیت عرضه و امنیت تقاضای انرژی». فصلنامۀ مطالعات اقتصاد انرژی. سال چهارم. شماره 13 (تابستان) ص 13-27. ملکی، عباس. 1393. سیاست­گذاری انرژی. تهران: نشر نی. یزدان­پناه درو، کیومرث؛ ناهید پوررستمی، ریحانه یوسفی و محمدرضا حسین­زاده. 1396. «بررسی تطبیقی ارتقای امنیت انرژی با بهره­گیری از انرژی­های تجدیدپذیر؛ در مقایسة ژئوپلیتیکی دو کشور ایران و ژاپن با الگوی مدیریت راهبردی». پژوهش‌هایجغرافیایانسانی. دورة 49. شمارة 3 (پاییز) صص711 – 729. Ahi, Arshia & Aryanezhad, Mir.B & Ashtiani, Behzad & Makui, Ahmad. 2009. »A novel approach to determine cell formation, intracellular machine layout and cell layout in the CMS problem based on TOPSIS method«. Computers & Operations Research. 36, 1478 – 1496. Ang B. W & Choong W. L & Ng T. S. 2015. »Energy security: Definitions, dimensions and indexes«. Renew Sustain Energy Rev. vol 42. pp 1077-1093. Asgharpoor, M.J. 2009. »Multiple criteria decision making«. Asia Pacific Energy Research Center. 2007. »A Quest for Energy Security in the 21st Century: Resources and Constraints (Tokyo, APERC)«. Bahgat, Gawdat. 2007. »Energy Security: Pacific Asia and the Middle East, in Energy Security in Asia, Edited by Michael Wesley«. London and New York. Routledge. Beier, J & Thiede, S & Herrmann C. 2017. » Energy flexibility of manufacturing systems for variable renewable energy supply integration: Real-time control method and simulation«. Journal of Cleaner Production. 141.pp 648-661. Chen, M.F & Tzeng, G.H. 2004. »combining gray relation and TOPSIS concepts for selecting an expatriate host«. Journal of Security (june). pp 12-22. Chester, L. 2010. »Conceptualising energy security and making explicit its polysemic nature«. Energy Policy. vol. 38. no 2. pp 887–895. Chu, T.C & Lin, Y.C. 2003. » A Fuzzy TOPSIS Method for Robot Selection«. Int J Adv Manuf Technol. 21. Pp 284–290. Drezel, Kleber. 2009. »The U.S. Department of Defense«. Valuing Energy Security. Elkind, Jonathan. 2010. »Energy Security: Call for a Broader Agenda«. In Carlos Pascual and Jonathan Elkind(eds). »Energy Security: Economics, Politics, Strategies and Implications(Washingtonm DC: Brookings Institution Prss) «. pp 119 – 148. Energy informatin administration (EIA). 2006. »Short-Term energy outlook, Sseptember«. Avaiiable at http://www.eia.doe.gov/pub/forecasting/steo/oldsteos/sepo. Florini, Ann. 2010. »Global governance and Energy « . In Carlos Pascual and Jonathan Elkind(eds). »Energy Security: Economics, Politics, Strategies, and Implications(Washington. DC: Brookings Institution) «. P 151-165. Gagnon, L & van de vate, J. F. 1997. »Greenhouse Gas Emission from hydropower: The state of research in (1996) «. energy policy. 25. Pp 7-13. Haghighi, Sanam. 2007. »Energy Security «. Portland. Hart Publishing. Hwang, C.L & Yoon, K. 1981. »multiple attribute decision making: methods and applications«. Springer. Berlin Heidelberg New York. International atomic energy agency (IAEA). 2008. »Reinforcing the global nuclear order for peace amid Prosperity «. The role of IAEA to 2020 and Beyond (Vienna: IAEA). Kessel, John & Stefan, Bakker & Bas, Wetzelaer. 2008. »Energy Security and the Role of Coal (Londan: IEA Clean Coal Center CCC/131) «. p 31. Kruyt, B & van Vuuren, D. P & de Vries H. J. M & Groenenberg, H. 2009. »Indicators for Energy Security«. Energy Policy. Pp 2166-2181. Löschel, A & Moslener, U & Rübbelke, D. T. G. 2010. »Indicators of energy security in industrialised countries«. Energy Policy. Vol 38. No 4. pp 1665–1671. Marilyn Brown, A & Sovacool, B.K. 2011. »Climate Change and Global Energy Security: Technology and Policy Options(Cambridge, MA: MIT press) «. Milani, A.S & Shanian, A & Madoliat, R. 2005. »the effect of normalization norms in multiple attribute decision making models: A case study in gear material selection«. Structural Multidisciplinary Optimization. 29 (4). pp 312–318. Naylor, Rosamond L &Adam, J & Liska, Marshall & B. Burke & Walter P & Falcon, Joanne C Gaskell & scott D. Rozelle & Kenneth G, Cassman. 2007. »the Ripple Effect: Food security, and the environment«. Environment. 49(9). pp30-43. Olz et al. contributions of renewables to Energy Security. International Energy Agency. 2006. »Enegy Technology Perspective: Senarios and Strategies to 2050 (Paris: OECD) «. Olz, Samantha & Ralph, Sims & Nicolai, Kirchner. 2007. »contributions of renewables to Energy Security «. International Energy Agency Information Paper (Paris: OECD, April). pp 13-27. Runge, Ford & Benjamin, Senauer. 2007. »How biofuels could starve the poor «Foreign affairs. 86(3) (May/June). pp41-45. Sajid, Z & Khan, F& Zhang, Y. 2016. »Process simulation and life cycle analysis of biodiesel production« Renew. Energy. 85. pp 945-952. Samuels, R. 1997. »Securing Asian Energy Investmentm«. the MIT Japan Program Science. Technology and Management Report. 4(2). (September/October). Sovacool, B.K. 2010. »The Routledge handbook of energy security«. Routledge. London. Sovacool, Benjamin K & christopher, Cooper. 2008. »Nuclear Nonsense: Why Nuclear Power is no answer to climate change and the world’s Post-kyoto energy challenges«. William & Mary environmental Law & Policy Review. 33(1) (Fall). pp 1-119. Tuzkaya, Gülfem & Gülsün, Bahadır & Kahraman, Cengiz & Özgen, Dogan. 2009. »An integrated fuzzy multi-criteria decision making methodology for material handling equipment selection problem and an application«. Expert Systems with Applications. U.s. Agency for International Development. 2008. »Energy Security Quarterly«. USAID South Asia Regional Initiative for energy (Washington, DC: USAID, January). pp 1-22. U.S. Department of Energy. 2010. »About the Department of Energy«. March. Available at http://www.energy.gov/about/index.htrn(accessed May 4. 2010). U.S. Energy Information Administration. 2015. 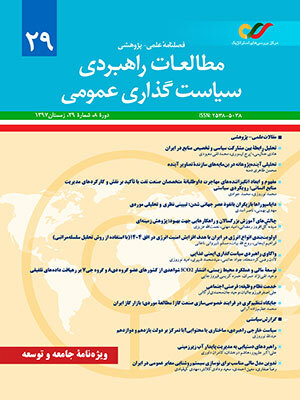 »Iran international analysis«. Venkata Rao, R. 2007. »Decision making in the manufacturing environment: using graph theory and fuzzy multiple attribute decision making methods«. (Springer series in advanced manufacturing). Springer. Vivoda, V. ٢٠١٠. »Evaluating energy security in the Asia-Pacific region: A novel methodological approach«. Energy Policy. vol 38. N 9. pp 5258–5263. Winzer, C. 2012. »Conceptualizing energy security«. Energy Policy. vol 46. pp 36–48. World Economic Forum. 2009. »Global Risks 2009: A Global Risk Network Report(Davos: World Economic Forum, January) «. Yang, T & Chou, P. 2005. »solving a multiresponse simulation–optimization problem with discrete variables using a multi-attribute decision-making method, Mathematics and Computers in Simulation«. 68. pp 9–21. Yong, Deng. 2006. »Plant location selection based on fuzzy TOPSIS«. Int J Adv Manuf Technol. 28. pp 839–844.